20 L liquid nitrogen tank is the use of high-strength aerospace aluminum manufacturing and high vacuum multilayer insulation design,Equipped with a protective cover, cylinder and lock cover,The container by the outer liner, liner, neck tube, insulation material, suction nozzle, cylinder etc..we are provide not less than five years of vacuum. Supplier & Manufacturer of Liquid Nitrogen Containers. 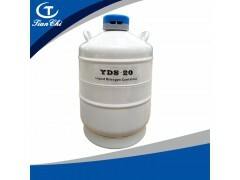 Our product range also comprises of Liquid nitrogen containers and Cryogenic Gas Cylinders. Our esteemed clients can avail them at various specifications like sizes, shapes etc. & at an affordable price range.